In this section, you can read the news articles published during the year. 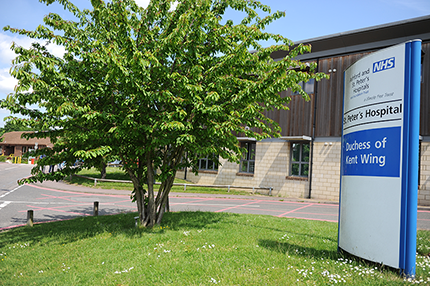 Following a recent unannounced inspection at the Trust by the CQC, Chief Nurse Sue Tranka, commented: “We are always very open to visits by the CQC and welcome their feedback and report. 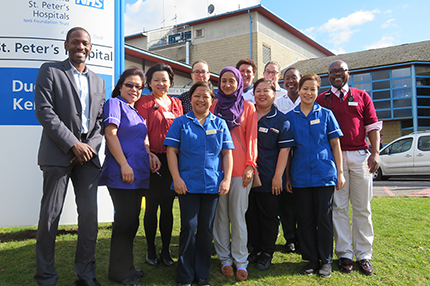 Whilst we recognise there are areas for improvement, we were encouraged to see many good areas of practice noted by the inspectors." 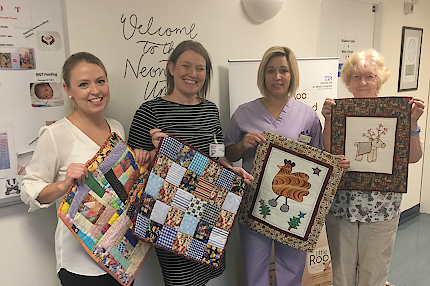 The Care of the Elderly Team have been working on various co-design projects with their patients, staff, relatives/carers and stakeholders, over the last few months to improve the department. 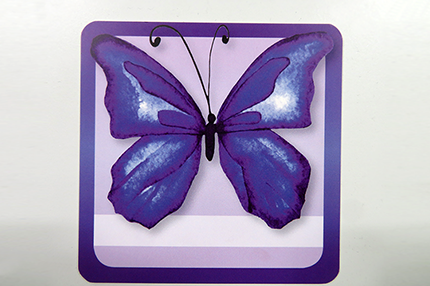 Our Care of the Elderly department provides treatment for conditions that affect the elderly population. 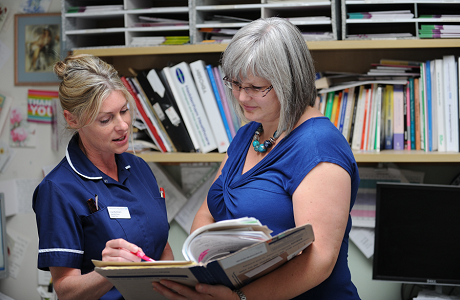 The medical team work across a number of wards throughout the trust. 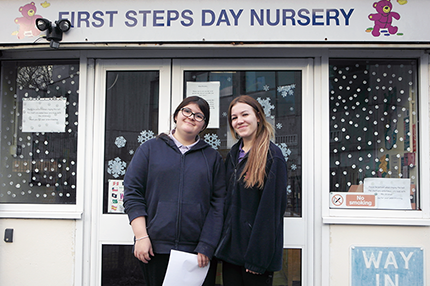 First Steps day nursery at St Peter’s Hospital NHS Foundation Trust has just celebrated with their two apprentices, Paige Ayres and Ellie Nardooni, who have just completed their Level 2 NVQ in childcare. 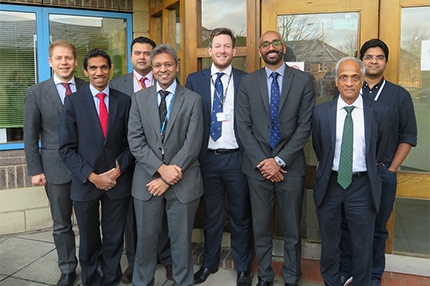 The urology team at Ashford and St Peter’s hospitals has launched a new way of working, known as virtual clinics. 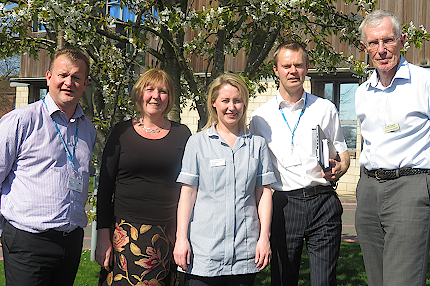 For many patients this will mean a quicker service and also avoiding an unnecessary trip to hospital. 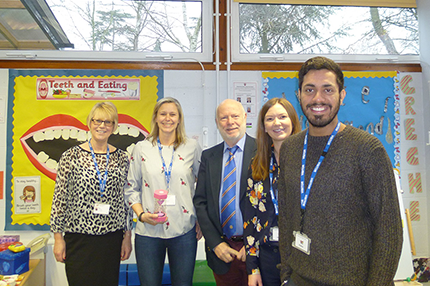 Linda Edwards, Mouth Care Matters Lead at Ashford and St Peter’s Hospitals, together with Dentists Dr Alice Jamison and Dr Pavandeep Narwal, recently visited Sayes Court Children’s Centre in Addlestone, to speak to parents about maintaining a healthy mouth for their children. 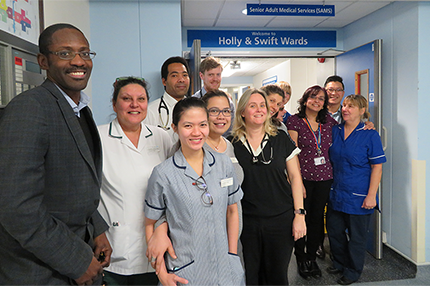 Ashford and St. Peter’s Hospitals Older People Short Stay Unit (OPSSU) and OPSSU team has been shortlisted in the ‘Improving value in the care of frail older patients’ category of the 2018 HSJ Value Awards. 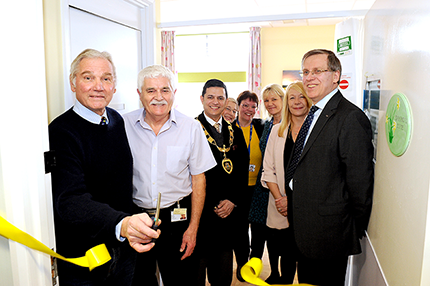 On Monday 12th March, the maternity team hosted a special event to officially open the newly refurbished Daffodil Room at St Peter’s Hospital. 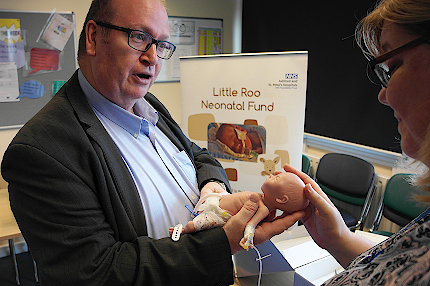 The room is used for parents experiencing the devastating loss of a baby, through a later miscarriage, termination of pregnancy for fetal abnormalities, stillbirth or neonatal death. 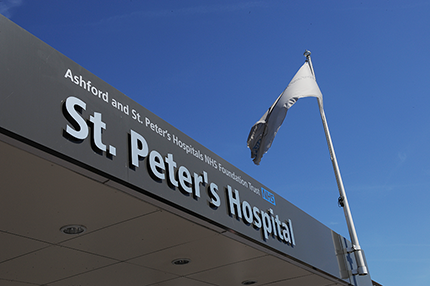 Major improvements to healthcare at St. Peter’s Hospital, Chertsey have moved a step closer after Runnymede Borough Council last week passed a resolution to approve planning permission for the redevelopment of surplus land at the hospital. 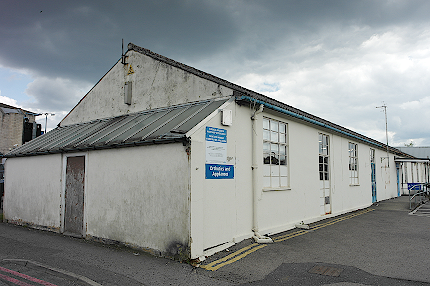 The result followed on from the officer’s recommendation for approval. 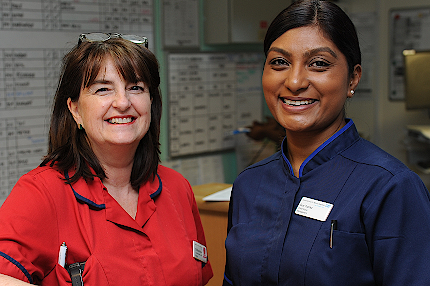 Ashford and St Peter’s Hospitals NHS Foundation Trust is delighted to announce that our Interim Chief Nurse Sue Tranka has now been substantively appointed to the position of Chief Nurse. 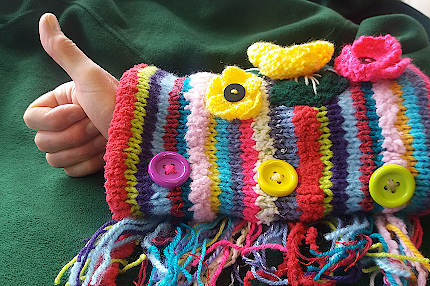 If you are coming to Ashford and St Peter’s Hospitals next week (16th – 20th April), you might find yourself being looked after by staff dressed in their pyjamas. 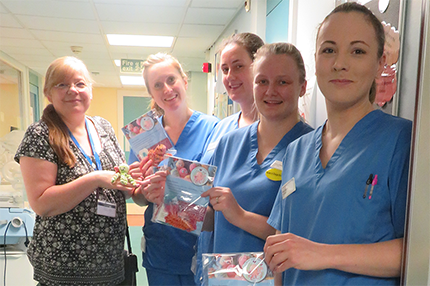 This is not the new uniform policy, but hospital staff adopting the national 70day #endPJparalysis campaign, supported by Professor Jane Cummings, Chief Nursing Officer for England. 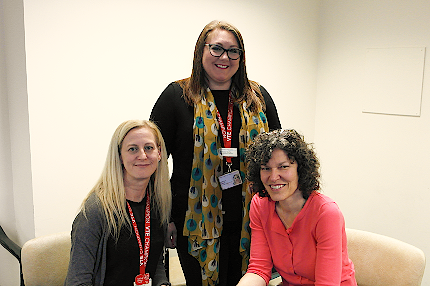 Surrey and Borders Partnership NHS Foundation Trust provides liaison mental health services for people with mental health needs accessing any of the five acute general hospitals in Surrey. 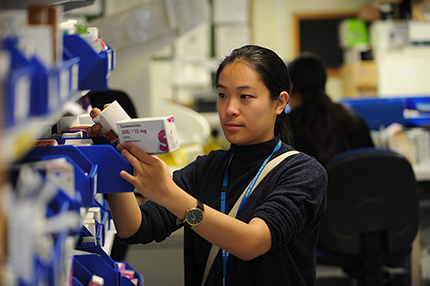 In partnership with The Royal Surrey County Hospital NHS Foundation Trust and Ashford and St Peter’s Hospitals NHS Foundation Trust, Surrey and Borders Partnership, has been awarded ‘Core 24’ funding from NHS England which will allow the expansion of this service from April 2018. 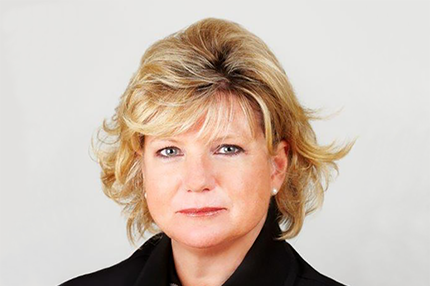 Ashford and St Peter’s Hospitals NHS Foundation Trust is delighted to welcome Marcine Waterman to the role of Non-Executive Director. 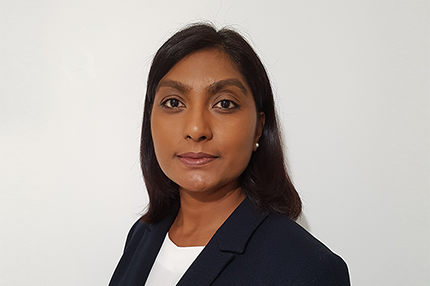 Marcine brings over 30 years’ experience in public finance to the role, so she is skilled in helping public sector organisations achieve good governance and value for money. 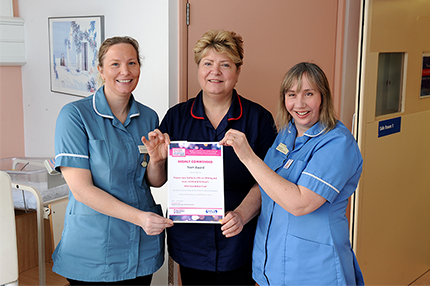 Recently Aspen Ward at St Peter’s Hospital won the Green Ward competition, which is a programme run by the Centre for Sustainable Healthcare. 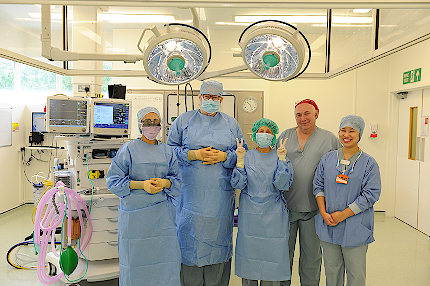 Operating Department Practitioners (ODP) have been working within the NHS for over 50 years under varying titles. The role is very similar to nursing but specifically situated in theatres and they are involved in each phase of a person’s operation. 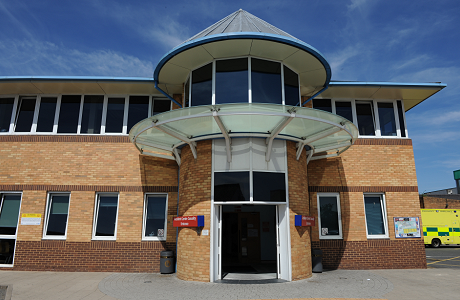 It is such a varied role that spans a variety of specialisms including Resuscitation, Critical Care and ITU. 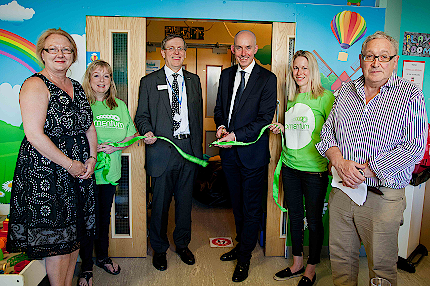 Ashford and St Peter’s Hospitals, Momentum Children’s Charity and Berkeley Homes come together to celebrate the opening of the Playroom and Sensory Room in the Paediatric Unit at St Peter’s Hospital. 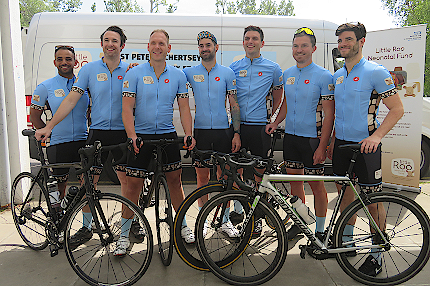 On Friday 18th May, Nico Wright and eight friends set off from Ashford and St Peter's Hospital's Neonatal Intensive Care Unit (NICU) on a 9 day cycle ride covering 1,315 kilometers to the Alps and up to the summit of Mont Ventoux - the "hardest of all the mythical Tour de France climbs". 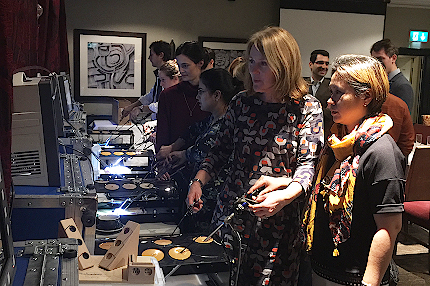 The CHKS Top Hospitals programme awards were held in London on the 15th May and hosted by NHS Confederation chief executive, Niall Dickson. 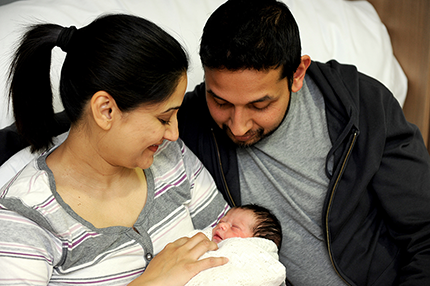 For the first time, CHKS considered all trusts in England, Wales and Northern Ireland. 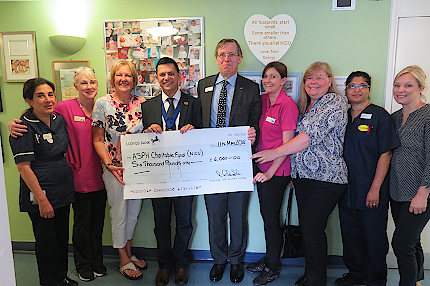 On Monday 28th May, Ashford and St Peter's Hospitals NHS Foundation Trust were delighted to welcome Cllr Chaudhri to the Trust's Neonatal Intensive Care Unit (NICU) to present his Mayor's Charity cheque. 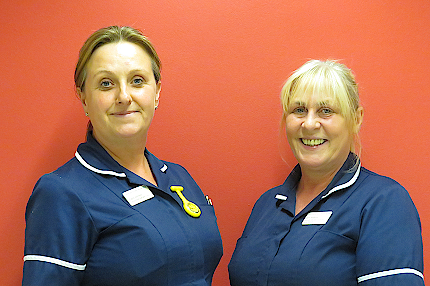 The Ashford and St Peter's Lung Cancer Nurse Specialists with support from the cancer support workers have established a Lung Cancer support group at Ashford Hospital. 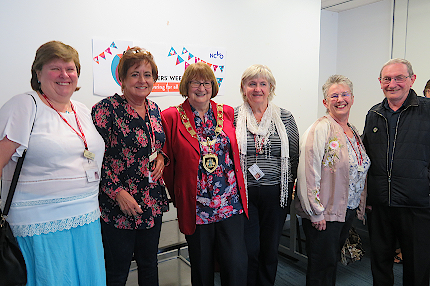 As part of National Volunteers Week, we have been celebrating our volunteers and as part of this we held a special coffee morning yesterday to show our appreciation for all they do to support our hospitals. 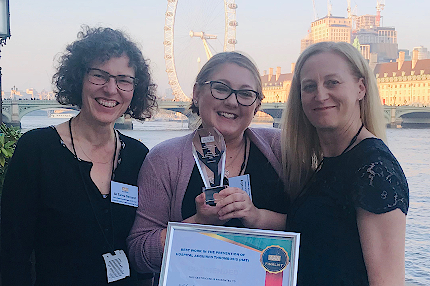 We are delighted to announce that Ashford and St Peter's Hospitals won a national award at the Healthcare People Management Association (HPMA) Excellence Awards, held on 7th June 2018, in the British Medical Journal (BMJ) careers category for Working Smarter. 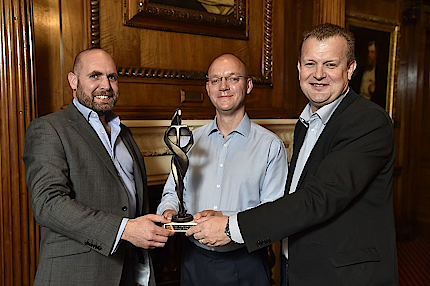 These awards recognise and reward outstanding work in healthcare human resource management. 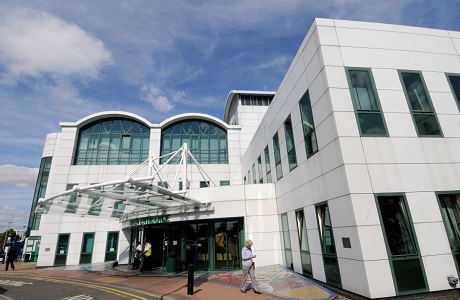 As a strong supporter of the 'Step into Health' initiative - which connects employers in the NHS to people from the armed forces community - and to celebrate Armed Services Week, Ashford and St Peter's Hospitals is holding a special careers event aimed specifically at armed forces personnel who are looking to transfer to alternative careers. On Tuesday 25th June the High Sheriff of Surrey, Mr Jim Glover, paid a special visit to St Peter's Hospital in Surrey to learn more about the Trust's partnership with Surrey County Council's Family Services; particularly the carpentry projects undertaken by young people referred to Surrey Family Services, to make items for the Neonatal Intensive Care Unit (NICU) and stroke rehabilitation service. 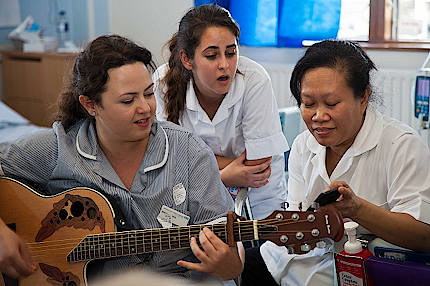 In celebration of the NHS 70th Birthday, Ashford and St. Peter's are holding a Recruitment Day for Nurses, Midwives, Operating Department Practitioners and HCA's. 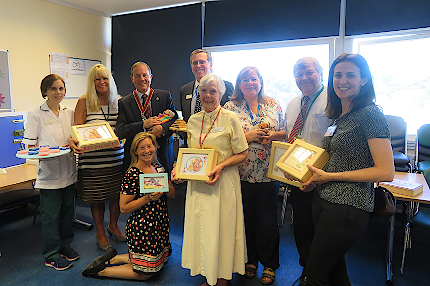 On Tuesday 3rd July Ashford and St Peter's Hospitals staff and volunteers were joined by special guests to bury a time capsule as part of the celebrations for the 70th birthday of the NHS. 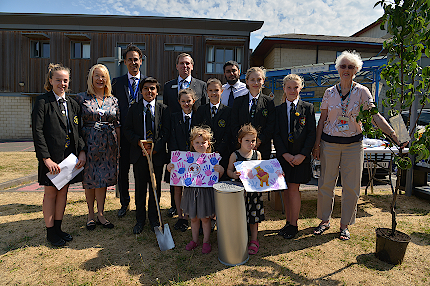 The event was all about preserving the present for future generations, so children from Magna Carta Secondary school and First Steps Day Nursery (the nursery on site at St Peter's Hospitals) came to join in the fun. We were also delighted to be joined by Deputy Mayor of Runnymede, Cllr Parshotam Sohi. 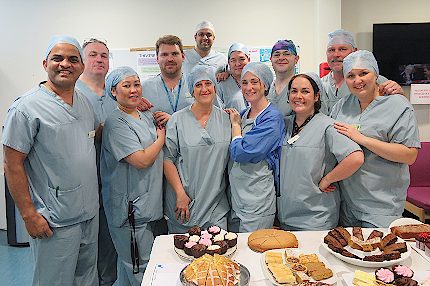 On Thursday 28th June Dr Emma Wilkinson, SAMS Consultant, and her team on our SAMS wards held a tea dance where they had dancing, music and food. 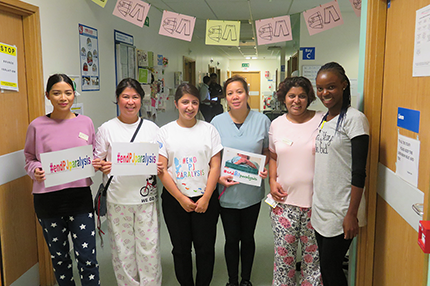 It was inspired by the #endpjparalysis campaign encouraging patients to get up, get dressed and get moving in hospital. 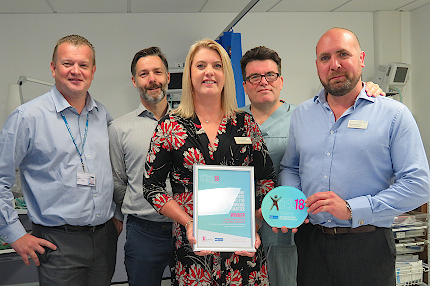 Ashford and St Peter’s Hospitals CEMIG (Centre for Endometriosis and Minimally Invasive Gynaecology) team won two awards at the annual British Society of Gynaecological Endoscopy Conference (BSGE) Conference, held in Edinburgh in May – The Silver video presentation award and a Bronze video poster award. Recently appointed Executive Director for Children and Families Service at Surrey County Council (SCC), Dave Hill, visited Ashford and St Peter’s Trust and spent time on the St Peters site to learn first-hand about the Trust’s partnership with SCC Family Services community projects; particularly the carpentry projects undertaken by young people referred to Surrey Family Services, to make items for the Neonatal Intensive Care Unit (NICU) and stroke rehabilitation service. 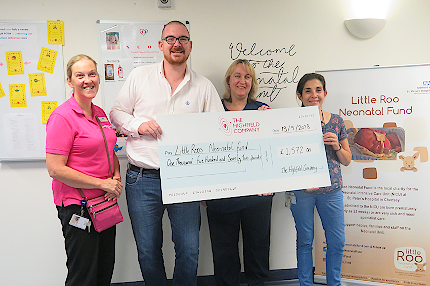 Matthew Rickett presented a cheque for £1,572.00, donated through the Little Roo Neonatal fund, to staff at Ashford and St Peter’s Hospitals for the Neonatal Unit on 13th September. 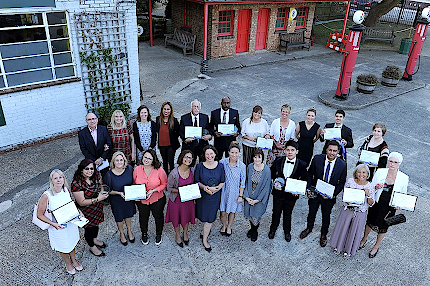 TV broadcaster and journalist Victoria Derbyshire, herself a former patient, hosted Ashford and St Peter’s Hospitals NHS Foundation Trust’s annual Staff Achievement Awards at Brooklands Museum on Friday 7th September. 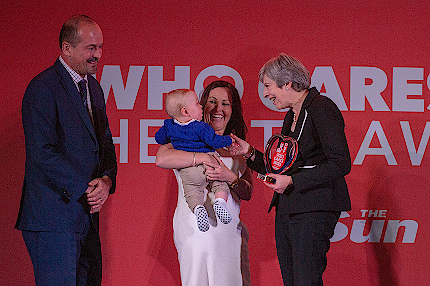 Awards were made in 11 categories, including Long Service Awards to 29 people. 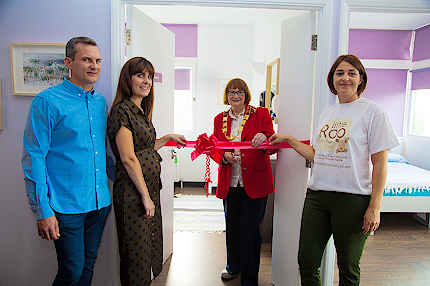 On 18 September, Cllr Dolsie Clarke, Mayor of Runnymede, opened the newly refurbished parents’ accommodation of the neonatal intensive care unit (NICU) at St Peter’s Hospital in Chertsey. 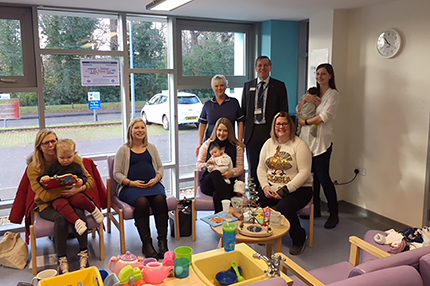 The refurbishment was completed by Richard Copperwheat, whose son Louise was born prematurely at Frimley Park Hospital before being transferred to St Peter’s NICU where he sadly passed away after six days of amazing care. 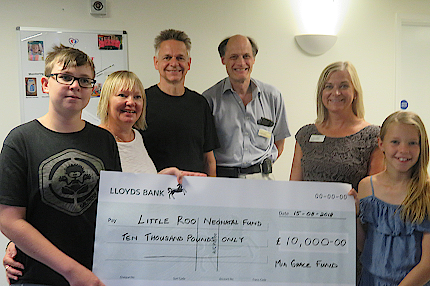 Sharon-Peirson Hagger and her husband, Russell along with daughter Mia (aged 10) and son Leo, (aged 13) presented a cheque on 15 August to Dr Tracy Lawson and Dr Peter Martin for £10,000 for Little Roo Neo-natal Fund on behalf of Mia who was born with complications at Ashford and St Peter’s Neo-natal unit ten years ago. 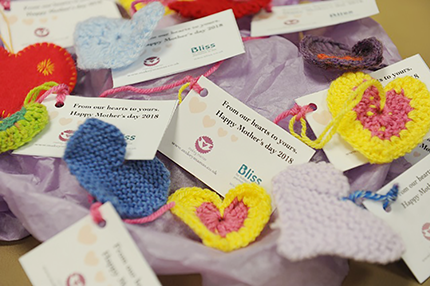 Ashford and St Peter’s Hospitals are committed to making sure that all mothers, children and families in their care receive all the support and help they need to ensure that children grow up in a safe and happy home. 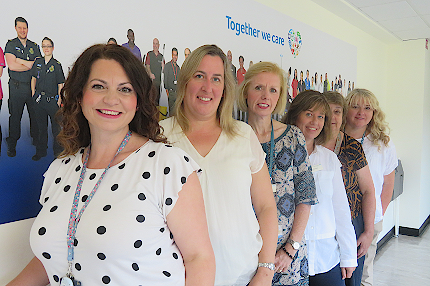 Ashford and St Peter’s Hospitals NHS Foundation Trust has retained their rating of ‘Good’ by the Care Quality Commission (CQC) for the second consecutive time. 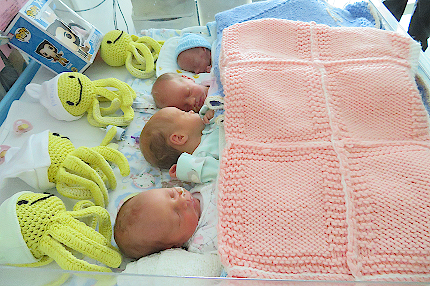 Staff in the Senior Adult Medical Services wards who care for the elderly at St Peter’s Hospital in Chertsey are appealing for donations of unwanted toys. 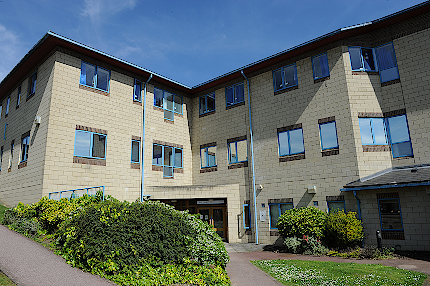 Runnymede Borough Council has given the go-ahead for the redevelopment of surplus land at St. Peter’s Hospital, Chertsey in a decision that will pave the way for major healthcare improvements for Surrey.